Fitness. How much more fun would getting regular exercise be if it were with your dog? Not only are there many running and other trails that allow pets, but you may also find fitness classes specifically for people and pets in your community. During the warmer months, if you’ve got a swimming pool or a dog-friendly lake in your area, take regular swims with your dog if he or she is comfortable and enjoys the water. 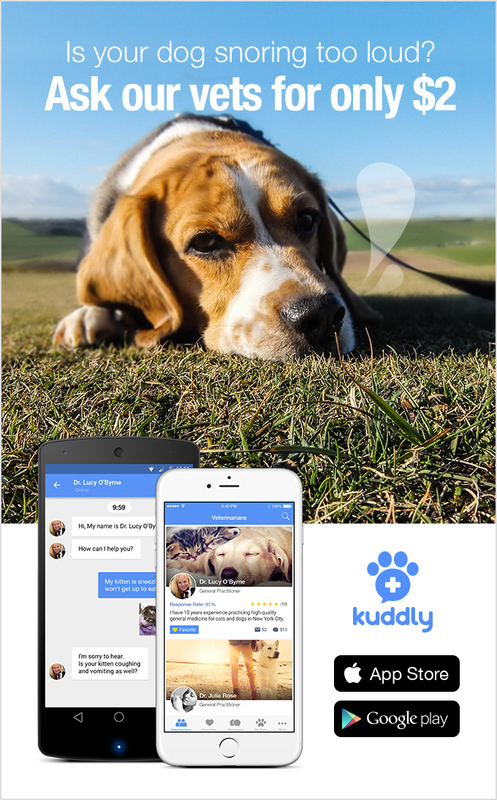 You can ask a vet on Kuddly for additional ideas for enjoying fitness with your pet. Diet. It’s no secret that good nutrition and high quality food and water benefit animals just as much as it does people. So if your goal is to eat healthier this year, share that goal with your dog, cat or other pet! This can include shifting to organic, eating more regular meals, portion control, you name it. Veterinarians on Kuddly can also share insight on healthy eating and food or nutrition tips for your pet to help you plan and change your pets diet along with your own. Sleep. While animals rarely skip a good night’s sleep or a comfortable nap, you can tap into their understanding of the value of sleep by napping when they do! There’s nothing like curling up with a furry friend and getting a great rest. Though don’t follow them too much for this item! With how often cats sleep, it’s said that they are really only awake about three years total in their entire lives. But you can still make for better rest with this fun approach to your goal none the less. Organization. Any pet owner can likely look around their house at this very minute and see a myriad of dog, cat or other pet toys and items within line of sight. So if you’re setting a goal to get your home more organized and keep it that way, incorporate your pet items in the same way. Stylish storage bins in wood, fabric or metal can be outstanding for stowing toys, leashes, and other items in a chic way that fits into home decor. Cleaning. If keeping the house or other space more clean this year is your goal, this is another you can also do with your pet. Make it a point to regularly wash your pet’s food and water bowls, replace or clean its plastic litter box for a fresh one once a year or so, and routinely clean other pet items and areas. Toys and bedding often get overlooked when it comes to cleaning, but should and can be included in the new year effort! Just be sure to read care instructions on bedding before you wash, and wash toys carefully ensuring that any soap, etc. you use isn’t going to be harmful to your pet. Getting out more. It’s fun to be social and socialization can be so good on many levels. You make new friends, enjoy other people’s company and other activities. This is also a benefit to many pets. Set up regularly plans to take your dog out for socialization — dog parks, pet play lands or even just going with you wherever you go can do the trick. While you can’t bring a cat out to meet other cats at a park, or your turtle in the car for a road trip, ask a veterinarian on Kuddly about ways that you can increase their activity or stimulation in their habitat or environment. Having fun. A common new year goal is to have more fun or enjoy life more, and that is an excellent one you can also include your pet! Even if it’s just playing in the house more regularly with your dog, cat or other animal, planning a trip with your pet to a pet-friendly location, or anything else that you can do that involves your animal can be a blast for both you and your pet. This is another question you can ask a veterinarian on Kuddly about. Not only can Kuddly help you learn about ways to have fun with your pet, but how you can keep your fur baby safe and healthy in the process. What a fun way to take on your new year goals! We hope everybody had a great and happy new year holiday. 2016, we are ready for you!